When business or the quest for adventure calls you off the beaten path you can pack light and stay connected. 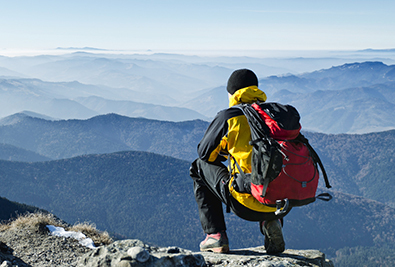 No matter how remote the mountainside you trek or distant the sea you sail, Infosat will keep you and your computer in touch with your colleagues and loved ones back home. Our backpack connections give you voice, data and Internet service virtually anywhere on earth. And the equipment won’t weigh you down. The gear is rugged, lightweight and completely portable. One of our most popular solutions is a little bit smaller than the box your smart phone came in. What remote communication solution do you need? A voice service? Data service? Or a solution that combines voice and data? Whatever your needs, we have proven solutions from leading manufacturers like Iridium, Inmarsat and LightSquared. Do You Need More than Just a Backpack Connection? If a backpack connection is just one component you need as part of a bigger remote communications solution, check out our other solution categories or take five minutes to build a solution framework using Resolve. Who Needs a Backpack Connection? Does Your Smart Phone Work Off Grid? Now It Can! Discover the Iridium GO! Infosat has been keeping people in remote areas connected with portable satellite phones since they were first introduced in the late 90s. Our services have been used on drilling platforms in the high Arctic, on emergency medical evacuations in Antarctica and in countless locations in between.